What Day Of The Week Was October 17, 2003? 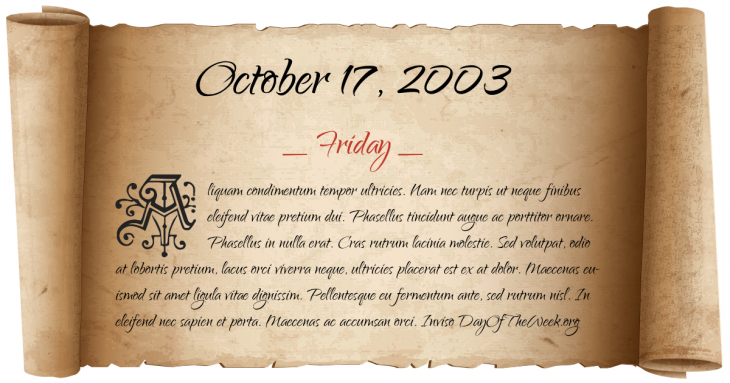 October 17, 2003 was the 290th day of the year 2003 in the Gregorian calendar. There were 75 days remaining until the end of the year. The day of the week was Friday. A person born on this day will be 15 years old today. If that same person saved a Penny every day starting at age 6, then by now that person has accumulated $34.73 today. Here’s the October 2003 calendar. You can also browse the full year monthly 2003 calendar. The pinnacle is fitted on the roof of Taipei 101, a 101-floor skyscraper in Taipei, allowing it to surpass the Petronas Twin Towers in Kuala Lumpur by 56 m and become the World’s tallest highrise.